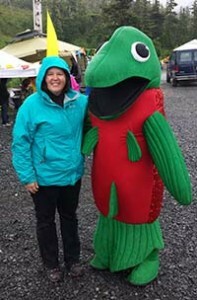 Outreach Coordinator Lisa Matlock makes a new friend at the 2014 Copper River Wild! festival in Cordova. After five years spreading awareness about the Council’s work to citizens in the communities affected by the Exxon Valdez oil spill, Lisa Matlock recently left the Council. As outreach coordinator, she worked with all of the Council’s committees, but particularly with the Information and Education Committee, fostering public awareness, responsibility, and participation in the Council’s activities through information and education. Matlock joined the Council in 2013 with twenty years of experience in science education and extensive knowledge of coastal Alaska. From her first days at the Council, she traveled the region, presenting educational programs, talking to city councils, and coordinating community receptions. She promoted programs that involve students in the Council’s mission and took the information booth to many conferences each year. Along the way, she encouraged young and old alike to become stewards of Prince William Sound. Matlock is responsible for one of the Council’s most popular new programs in recent years: community tours of Alyeska’s oil spill response training for local vessels. Local mariners, mostly fishing crews, are trained each year in spill response techniques so that they are prepared to help in case of a spill. The trainings are held in Valdez, Cordova, Whittier, Seward, Kodiak, and Matlock’s former home, Homer. When Matlock joined the Council in 2013, she found out. She decided more people needed to know about Alyeska’s program, so she set about making sure that happened. The resulting program, a partnership between the Council, Alyeska, local businesses, and nonprofits, has travelled to Seward, Cordova, Homer, and Whittier so far. Hundreds of local residents now understand how this unique spill response program works. Today, this program strengthens an important bond between communities, fishermen, industry, citizen oversight groups, and marine conservation efforts. Matlock’s replacement, Betsi Oliver, joined the Anchorage staff in September. Her science educator background began with a job as a science camp counselor which led her to an internship as an environmental educator at Kenai National Wildlife Refuge soon after college. In the ten years since, she has served as an AmeriCorps volunteer creating outreach materials about Prince William Sound, worked at the Bureau of Land Management’s Campbell Creek Science Center, guided sea kayak tours from Seward for two summers, and ran the youth engagement program at Alaska Geographic. Oliver created a new program for Alaska Geographic, guiding teens and local teachers on sea kayak expeditions in Prince William Sound, part of the Chugach Children’s Forest program. The program was co-funded by the Council as part of efforts to involve students in the mission of the Council. 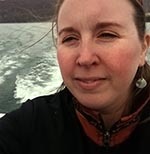 Prior to joining the Council, she worked as the grants manager for Anchorage Park Foundation, taught wilderness first aid, and led courses for the Chugach School District. 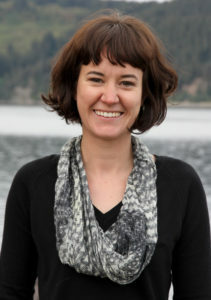 “The overlapping combo of science, teaching, outreach, travel, connection to small Alaska communities, complex partnership cultivation, volunteer coordination, and in particular long-term impact to the communities and environment creates a work profile that feels very meaningful and fulfilling,” Oliver says about her new position. Shawna Popovici, the project manager assistant for the Anchorage office, resigned in January. Popovici worked closely with the Council’s Information and Education, Scientific Advisory, Legislative Affairs, and Board Governance committees and managed the Council’s extensive internal document management system. Popovici accepted a management position with the Alaska Department of Natural Resources Division of Parks and Outdoor Recreation. She will be heading up the Interpretation and Education efforts for the division. Popovici joined the Council in 2015.